Getting Things Done has always been a bit of an issue in Tasmania, what with our five or six thousand local councils all with their full complement of bewildering rules picked out of a hat. The Hobart Interim Planning Scheme, soon to become the state-wide Tasmanian Planning Scheme, is â€˜faster, simpler, cheaper and fairerâ€™ which of course means that pretty much anything goes now, which is a typically Tasmanian way of solving a problem by making things much much worse. The Hobart City Council recently approved plans for a large-scale residential development on former Blundstoneâ€™s site in Wynyard Street, South Hobart. If you take a look at the details here,Â you’ll discover that the politest description for this development proposal would be “wildly inappropriate to theÂ localÂ area”. SOS is raising funds to appeal the proposal, not to block any and all development of the site, but to get a more reasonable outcome. To do my bit (as a worm-farm owning South Hobart type myself) for every calendar bought from this website for a delivery to a South Hobart address up to the cutoff date of November 30, I’ll chip in $5 to the cause. 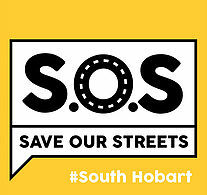 Posted in News and tagged south hobart, save our streets.